Big ocean = big data: about a dozen observing systems supplied the data needed to make this never-before visualization of ocean currents. As master leaker Edward Snowden searches for asylum, revelations of widespread collection of telephone and email records by the National Security Agency have set teeth on edge. The Obama Administration says the data bring security, yet voices on the left and right both have condemned the snooping as an invasion of privacy. Data is not information, but rather the raw material for understanding. But one thing’s for sure: as the NSA spends billions perfecting new means of “mining” information from its mountains of data, it benefits from the plummeting price of computer storage and processing. Data mining is a broad term for mechanisms, frequently called algorithms, that are usually enacted through software, that aim to extract information from huge sets of data. A hard drive capable of holding a terabyte of data might have cost $1,000 around 2005, “but now you can put that on a thumb drive for less than $100,” says Krakauer, who studies the evolution of intelligence. The current talk about big data and data mining “is happening because we are in the middle of an earthquake; we feel it in a way we did not before,” Krakauer says. This visualization of ocean surface currents between June, 2005 and December, 2007 is based on an integration of satellite data with a numerical model. Eddies and narrow currents transport heat and carbon in the oceans. The Estimating the Circulation and Climate of the Ocean project provides ocean flows at all depths, but only surface flows are used here. These visualizations are used to measure the ocean’s role in the global carbon cycle and monitor heat, water, and chemical exchanges within and between different components of the Earth system. Is Big Data watching you? Beyond security and commerce, big data and data mining are also surging in science. As more instruments with finer sensors return ever-more overwhelming data streams, more analytical horsepower is needed. In fields like meteorology, petroleum exploration and astronomy, gushers of data support — even demand — a new level of analysis and insight. 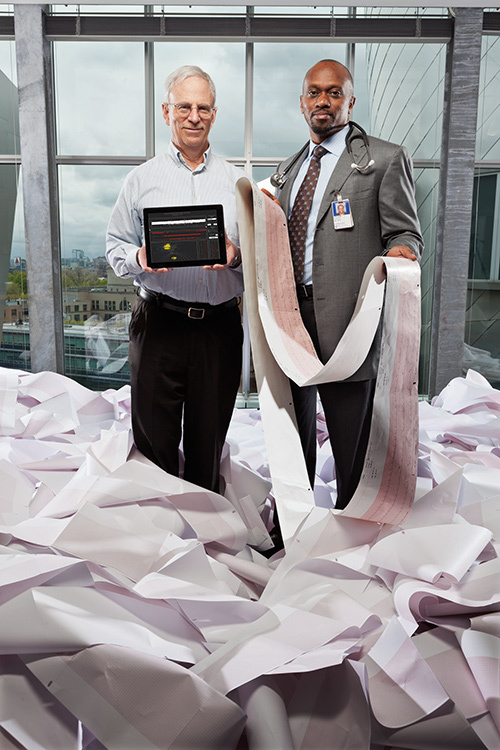 MIT researchers John Guttag and Collin Stultz built a computer model to analyze formerly discarded electrocardiogram data from heart attack patients. Using data mining and machine learning to sift the massive data, they associated three electrical abnormalities with a doubled or tripled risk of dying from a second heart attack within one year. The new approach could catch more high-risk patients, who are usually not detected with existing risk screening. One milestone in the emergence of big data in medicine was 2003, when the first human genome was completed. Since then, the breakthrough genome has been augmented by thousands of others for individuals, primates, mice and bacteria. With billions of “letters” per genome, the threat of computational confusion helped spawn the new field of bioinformatics, which harnesses software, hardware and sophisticated algorithms to support new types of science. As medical scientists try to cope with cancer, bacteria and viruses, political chatter has “gone viral” on the Internet. The Twittersphere has surpassed half a billion tweets per day, and its political clout is surging, confronting clean-government groups with a phenomenal data-mining challenge. Truthy was developed by Indiana researchers Fil Menczer and Alessandro Flammini. 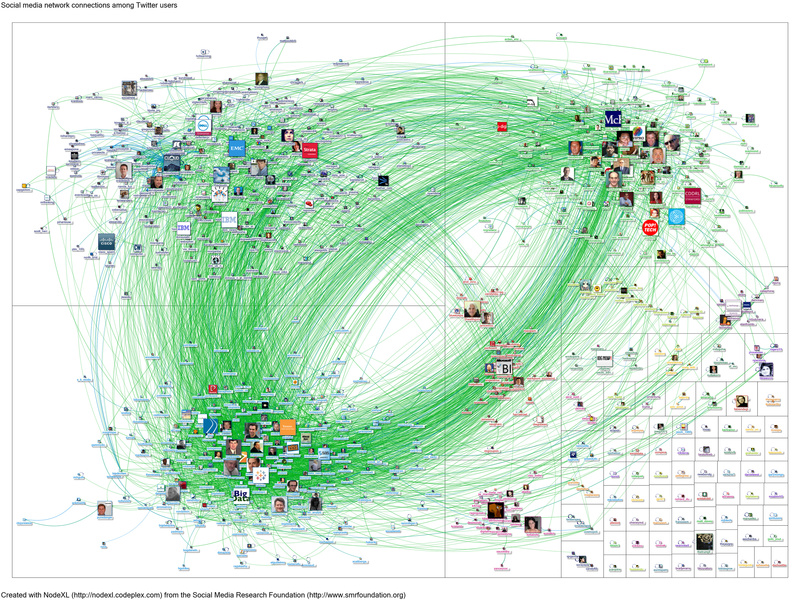 Each day, the project’s computers screen upwards of 50 million tweets for patterns. Big data watches “#bigdata.” These connections appeared among the Twitter users who tweeted “bigdata,” scaled by numbers of followers. Blue lines show connections created when users reply or mention; green lines show one person following another. The human brain is the ultimate calculating machine, and the ultimate big-data predicament, with an uncountable number of possible connections between individual neurons. The Human Connectome Project is an ambitious effort to map interactions among the different brain regions. 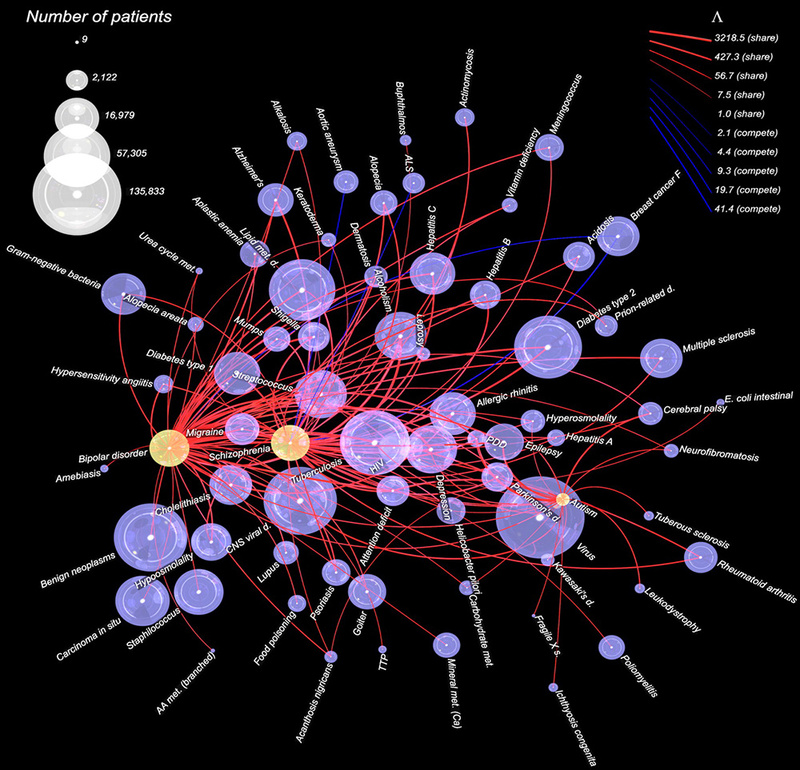 The goal of the connectome “is to collect advanced neuroimaging data, along with cognitive, behavioral and demographic data on 1,200 individuals” who are neurologically healthy, says Daniel Marcus, head of informatics at the Connectome’s facility at Washington University in St. Louis. Image courtesy M. F. Glasser and S. M. Smith for the WU-Minn HCP consortium. 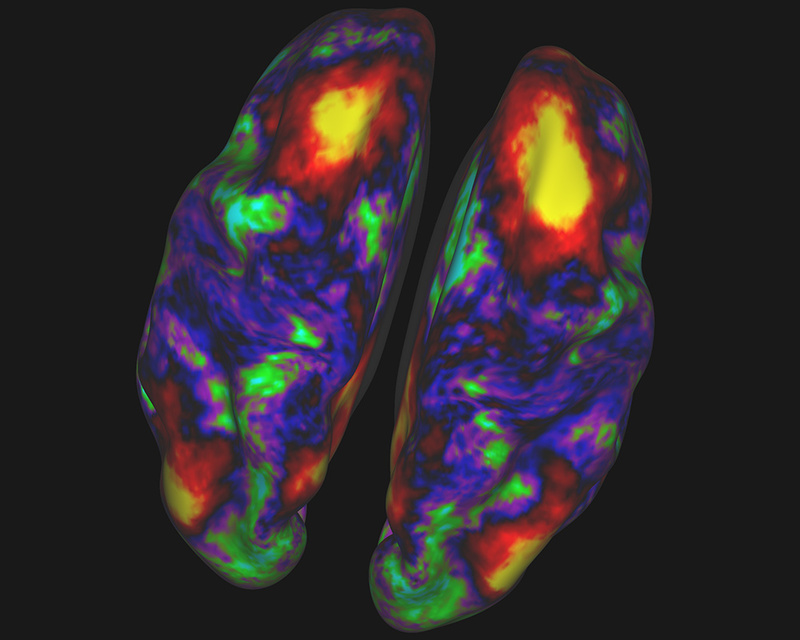 Colors show correlations in metabolic activity in the human cerebral cortex while 20 healthy subjects were at rest in the MRI scanner. Yellow and red regions are functionally connected to a “seed” location in the parietal lobe of the right hemisphere (yellow spot at top right). Regions in green and blue are weakly connected or not connected at all. The project is using three types of magnetic resonance imaging to view the structure, function and connections in the brain. When data collection finishes two years from now, Marcus expects connectome researchers to be slogging through about one million gigabytes of data. 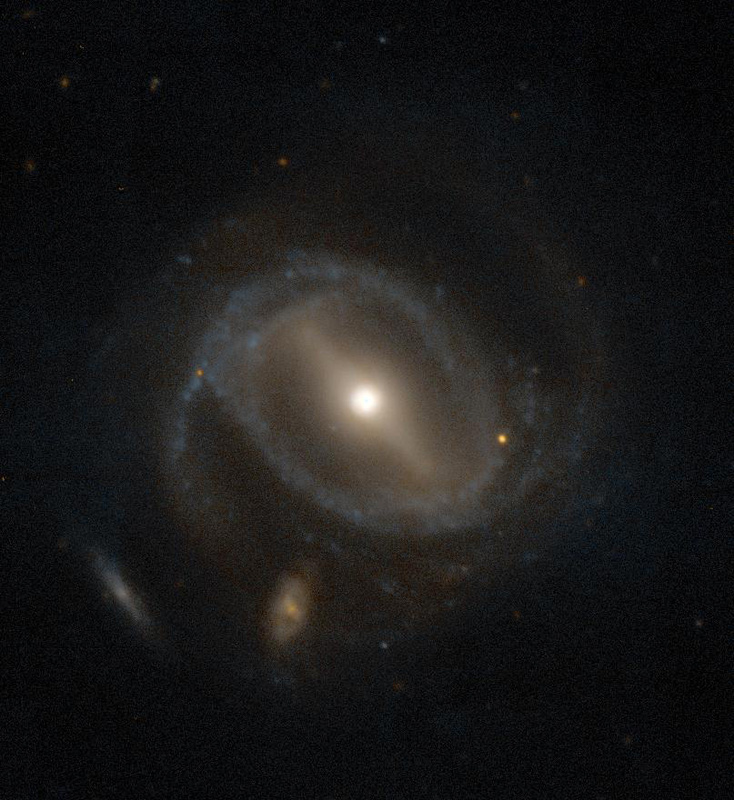 Galaxy zoo: Crowd-sourcing to the heavens! The Galaxy Zoo project breaks the rule for big data: Instead of putting data through a massive, computerized data-mining, it feeds images to motivated volunteers who do basic classifications of galaxies. The Zoo, launched in 2007, traces to Oxford, England, where astronomer Kevin Schawinski had just finished staring at 50,000 images from the Sloan Digital Sky Survey. This backlit galaxy, one of almost 2,000 found by Galaxy Zoo volunteers, is lit by the galaxy behind it. Backlight highlights dust in the foreground galaxy. Interstellar dust is a key player in star formation, but is also produced by stars, so tracing its amount and location is critical to understanding the history of galaxies. Galaxy Zoo’s startup was so successful that user traffic physically damaged a server, Keel says. After all 950,000 images in the Sloan survey were seen an average of 60 times apiece, the Zookeepers have moved on to larger surveys. Science is being served, Keel says. “I have gotten a lot of mileage out of oddball things that people have found,” including backlit galaxies. Galaxy Zoo relies on statistics, multiple viewers and logic to process and check data. If the proportion of viewers who think that a certain galaxy is elliptical remains fixed as more people see it, the galaxy would be retired from viewing. New doors open as the price of data and communication continues to fall. 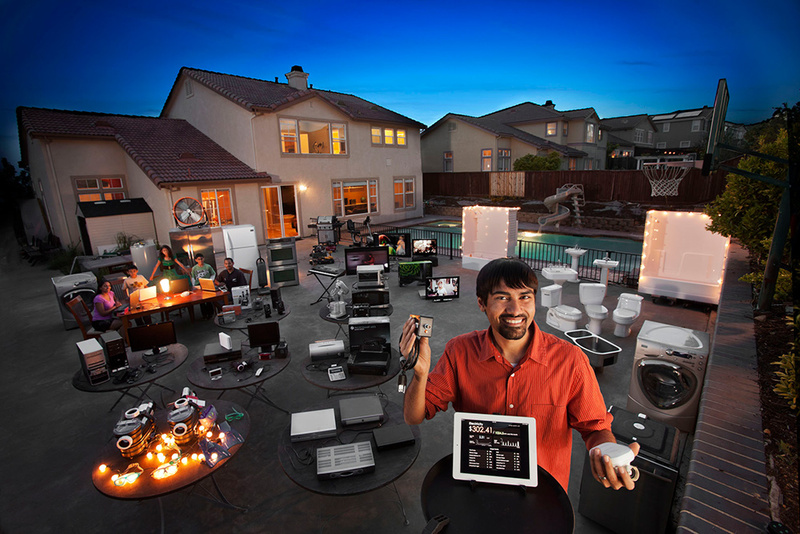 If you’re wondering how much water and energy each device in your house gobbles, MacArthur Fellow Shwetak Patel has a solution: wireless sensors that recognize the unique digital signature of each device. Patel’s smart algorithms, combined with a plug-in sensor, inexpensively identify the biggest wastrels. This Hayward, Calif. family was surprised to learn that video recorders were snarfing 11 percent of their household power. The Zoo approach is being copied and refined by zooniverse.org, a parent organization that runs about 20 projects on, for example, tropical cyclones, the surface of Mars and climate data stored in ship logbooks. Eventually, software may nudge out the volunteers, Keel says, but the line between computer and human is fungible. The Supernova Zoo, for example, was shut down after software learned the task. The utility of a giant dataset may go through a “phase transition,” Krakauer adds, after a relatively small change in processing capacity leads to a breakthrough in results. Big data becomes an issue “When we have the technology that allows us to collect and store data that has outpaced our ability to reason about the system under scrutiny,” Krakauer says.